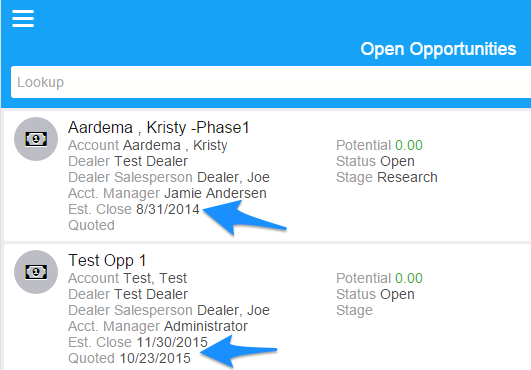 In the Infor CRM (Saleslogix) Mobile client, dates in group lists are displayed as relative dates. You’ll see dates in the group list like “10 days ago”, “3 months ago”, or “a year ago”, and so on. This applies to future dates as well, seeing values like “in a month”. Notice the relative dates in the screenshot above. However, if you’d like to see actual dates instead of relative dates there is a simple solution. 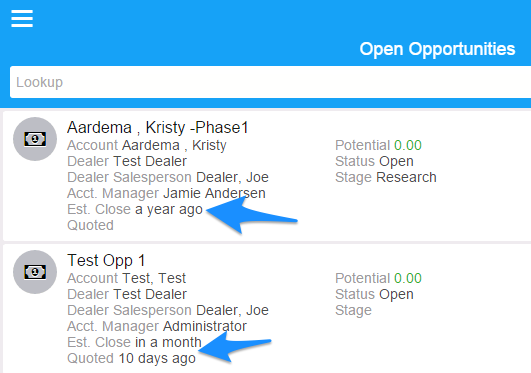 To display actual dates instead of relative dates in all group lists (keep in mind this change applies to all dates in all group lists), simply add the following to your ApplicationModule. Note: the reference to GroupUtility in the AMD references. With that code in place you’ll see the actual dates.